Contains a small quantity of anti-caking additive to maintain spreading properties after prolonged storage. Not as pure as white salt and therefore not as clean to use. It is ideal to start thinking about how to tackle bad weather before it arrives, it is always better to be over prepared rather than being caught out when it does arrive. Our brown rock salt is an ideal product for you to stock up on, before the winter snow comes. Although it may not be as clean to use as white rock salt, it contains an anti-caking additive so it can be stored for long periods of time without losing any of its spreading or melting properties. It complies with British Standards BS3247 so you can be sure that it will effectively melt snow and ice around your premises. It is always best to be prepared when it comes to winter weather, as it will allow your company to continue business as usual, even in difficult conditions. They are supplied as 25kg bags and there is a choice of qualities to choose from; 1, 10, 20 or 40 bags. 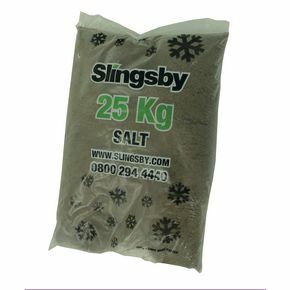 Our brown rock salt is available with a 12 month guarantee and Next Day Delivery.